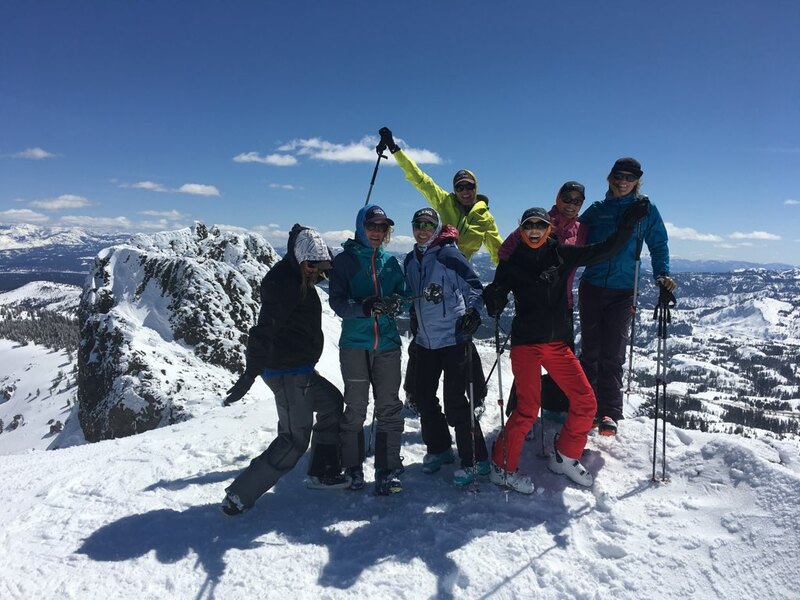 Just 8 Spots Available | This women's intro to backcountry skiing clinic introduces the tools and techniques that you'll need to venture into the backcountry on your skis. Day 1 – 8am start – First day out. Welcome to backcountry skiing! Increase familiarity and comfort with movements and equipment. Designed for skiers who love spending time in the mountains riding fresh snow and who want to start traveling in the backcountry. No backcountry experience is necessary. 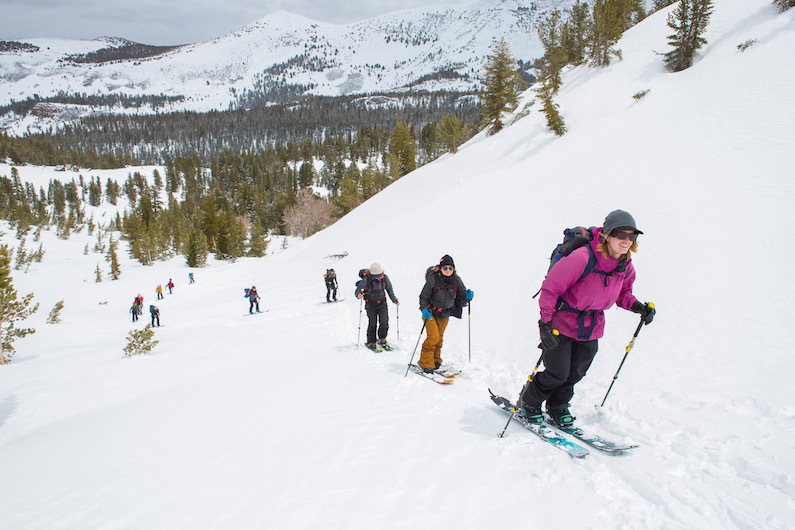 This Intro to Backcountry Skiing course will consist of one intro night and 2 days in the Tahoe Backcountry. This course will go a bit deeper than a typical single day intro course by providing two full days of backcountry skills education with AMGA trained guides. This course is a fantastic precursor to a traditional three day avalanche course. Skiers taking this course should be mentally and physically prepared to spend the whole day outside in winter elements hiking and skiing. We will pace ourselves, but the days are full! We will search for the best conditions but the weather can be variable. The skiing experience and positive attitude each individual brings to the course will enhance the weekend. Good physical fitness is recommended. At a minimum, skiers should be able to ski multiple laps in ungroomed terrain, and hike for up to an hour while carrying a light pack. Intermediate and Advanced skiers. Skiers must be competent in a variety of terrain and snow conditions. Skiers must be able to link turns on ungroomed runs while maintaining control. This is comparable to skiing ungroomed black diamond terrain confidently. Intro night! Get gear and packs dialed for the first day, meet new friends. First day out. Welcome to the backcountry! Increase familiarity and comfort with movements and equipment. Review movement and equipment. Learn more efficiency and continue to refine skills. Apré: Celebrate accomplishments of the past couple days and talk about future trips! Do I need experience to be a part of this clinic? You must be able to turn confidently and ski black diamond terrain in all conditions. Be prepared to spend 6 hours in the winter elements at and above 6200’ while climbing/hiking. We will hike for about 3-4 hours per day, about 1500’ vertical gain. Is previous avalanche education required? No avalanche education is required. This clinic is the perfect prerequisite for an AVY 1 course. The goal of this course is to prepare you to enroll in an avalanche course equipped with confidence in both your gear and skills, so that during the AVY 1, all of your energy can be focused on learning about avalanche safety. Do I need avalanche gear? Yes, you need to have a beacon, probe, shovel and backpack. Avalanche gear is available to rent through Alpenglow Expeditions. Each person is responsible for their own food, snacks and drinks. 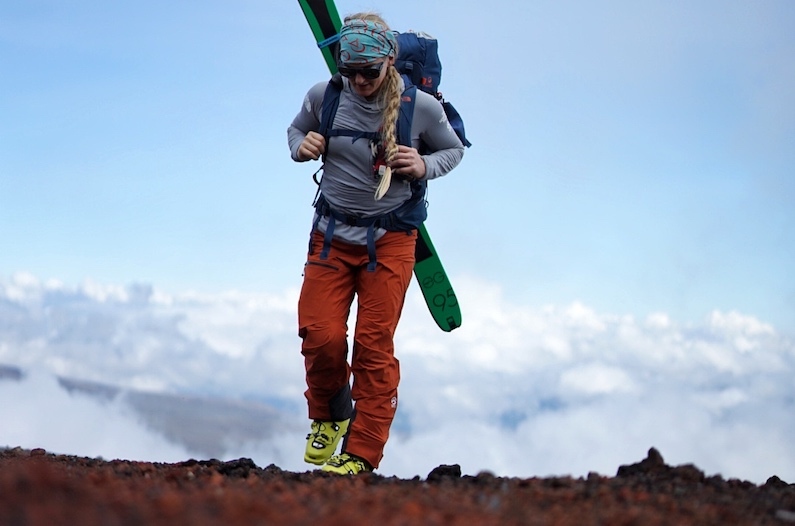 Tailer is a young aspiring mountain guide, with her focus on becoming one of the first few certified female splitboard guides. Tailer started as an intern with Alpenglow Expeditions during the 2017-18 winter and is on the path of AMGA education. She has “tailed” many groups with the Alpenglow team, and also helped out around various aspects of the business. 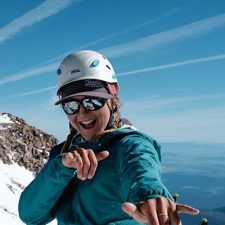 During spring and early summer, she guides on Mount Shasta, teaching clients mountaineering skills, and she returns to Tahoe for the summer rock season. She loves sharing the outdoors with others through snow sports as well as rock climbing. Nothing charges up her spirit more than showing people how much fun you can have in the mountains; all while maintaining safety and incorporating leave no trace ethics. 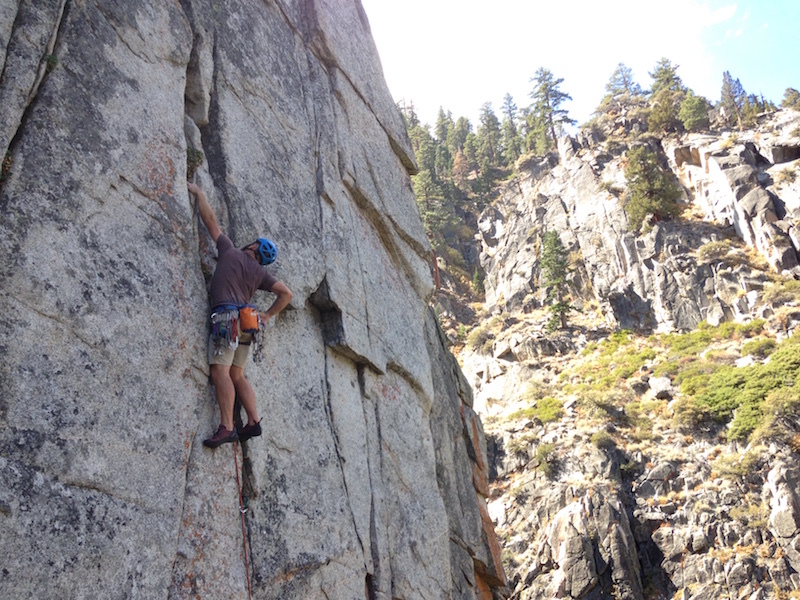 Tailer is an AMGA certified single pitch instructor. 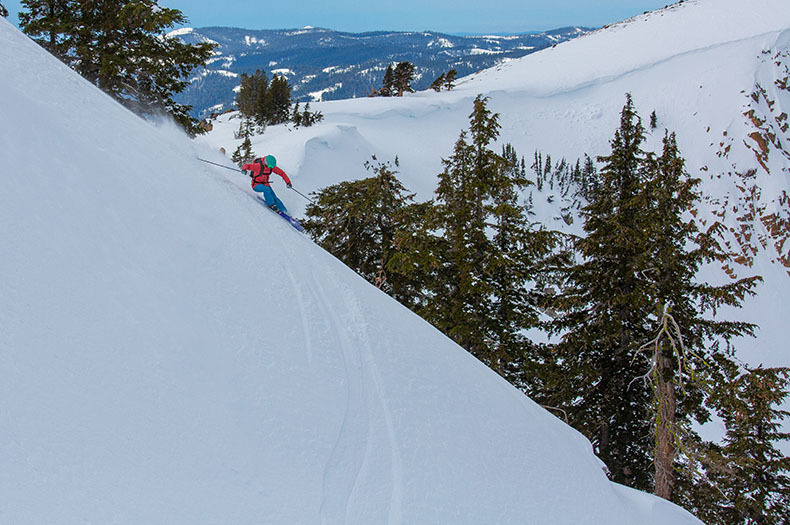 An avid climber and skier, Maggie is at home in Tahoe’s mountains. 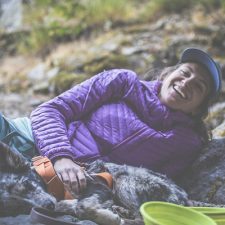 She manages the local program at Alpenglow Expeditions and delights in sharing her passion with clients and getting them outside to rock climb and backcountry ski. When she is not climbing on Donner Summit or ski-touring on Castle Peak, she enjoys drawing cartoons. Maggie is obsessed with her 1-year-old rescue pup and can’t imagine a better adventure buddy to enjoy the Sierra Nevada with. Emily was our office manager from 2009-2015. She left her provenance of New York City in 1998 and has been working odd jobs in Squaw Valley, CA for about 8 years in order to maintain her schedule, which demands time for skiing, biking or climbing on a daily basis. Working on the Alpenglow team was her first exposure to the world of high altitude climbing and she is finding herself increasingly intrigued by this discipline. 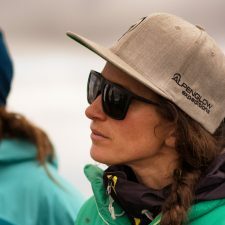 Although she has moved on from day to day operations, Emily has returned to manage the chaos that is Base Camp on our season Everest expedition. Thank you for an amazing weekend adventure backcountry skiing! We loved it. Orientation was excellent and helpful. We loved our guides who made the trip. Sydney was a natural leader - patient, competent, and kind. She put us all at ease and read the conditions of the terrain and of our group energy along the way. Her mountain experience and competence and natural leadership skills were real assets to our experience. She and Tailer worked well together - bookending our group and making sure we were in good shape. They both instructed us, teaching their tips and offering experienced advice and humor. We all felt so accomplished and happy at the end of our two day clinic. We are excited to book another trip with Alpenglow. Iris’ infectious attitude and expert knowledge made my time in the backcountry. I had so much fun and never felt insecure as she pushed and encouraged me beyond my limits. Earning turns with her was one of my greatest life experiences, both humbling and full of laughs!